CERBA is organizing a multi-sector trade mission to Uzbekistan on May 13-17, 2019. The Canada-Uzbekistan Business Forum will take place in the capital Tashkent in conjunction with the official launch of CERBA's Uzbekistan office. We will organize individual programs of meetings for each participants with potential clients/partners as well as visits of companies (specific program TBD). CERBA will be working in collaboration with the Government of Uzbekistan and the Canadian Embassy and Ministry of International Trade Diversification. In 2017, with the drivers of the old growth model exhausted, Uzbekistan launched an ambitious program of market-oriented reforms that were unprecedented in the country’s modern history. The Government’s National Development Strategy for 2017–21 aims to transform the country by liberalizing the economy, reshaping the role of the state in the economy, modernizing the agriculture sector, strengthening governance, creating markets, including in financial services, enabling private sector growth, investing in human capital, and improving social protection and service delivery for all citizens. The Strategy, to be implemented over five years, is guided by an annual state program. THE MISSION WILL BE CONFIRMED IF THERE ARE SUFFICIENT PARTICIPANTS. 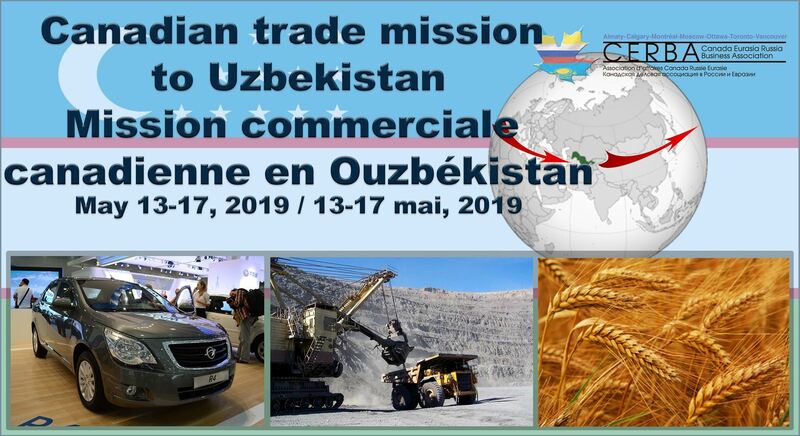 CERBA organise une mission commercial multi-sectorielle en Ouzbékistan les 13-17 mai 2019. Le Forum d'affaires Canada-Ouzbékistan se tiendra dans la capitale Tashkent en coordination avec l'inauguration du bureau de CERBA dans ce pays. Nous organiserons un programme de rencontres individuelles avec des potentiels clients et partenaires pour chaque participant ainsi que des visites d'entreprises. CERBA travaillera en collaboration avec le gouvernment Ouzbek, l'ambassade canadienne et le Ministère de la diversification du commerce international. SVP ENVOYER VOTRE EXPRESSION D'INTÉRÊT AVANT LE 31 JANVIER 2019. LA MISSION SERA CONFIRMÉE SEULEMENT S'IL Y A SUFFISAMENT DE PARTICIPANTS.